This past Sunday we successfully extracted ourselves from our cushy driveway parking spot. We said goodbye to long showers, the convenient washing machine, and those crazy cats. Only for a week though. We’ll be back next weekend for another visit (this time Tim’s mom is coming down and he’s taking some days off work – yay!) But for now we’ve relocated about 5 hours inland to the outskirts of Charlotte, NC. Charlotte is where Tim’s work office is located- the office that he’s never visited before. He’s also never met most of the people he works with in person. Today was his first day going into the office and it will be interesting to hear what he says at the end of the day. As someone who is not exactly an early riser, the commute straight from bed to desk seems to suit him well. 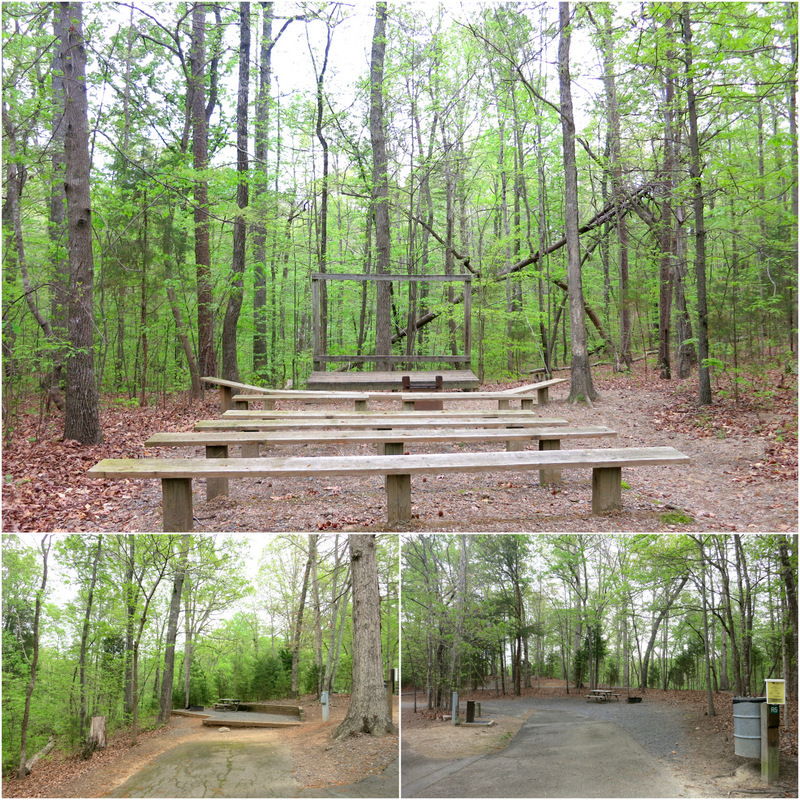 As usual, when we decided to visit Charlotte we looked around for a public campground. The only one anywhere near the city was McDowell Nature Preserve. So that’s where we ended up. With the exception of our hilly campsite that required all of our leveling blocks, plus some creative solutions such as the toolbox as an extra step to get into the Airstream, and the wheel ramp to boost up the front stabilizers (note to self: we need another set of Lynx Levelers), it’s pretty nice around here. 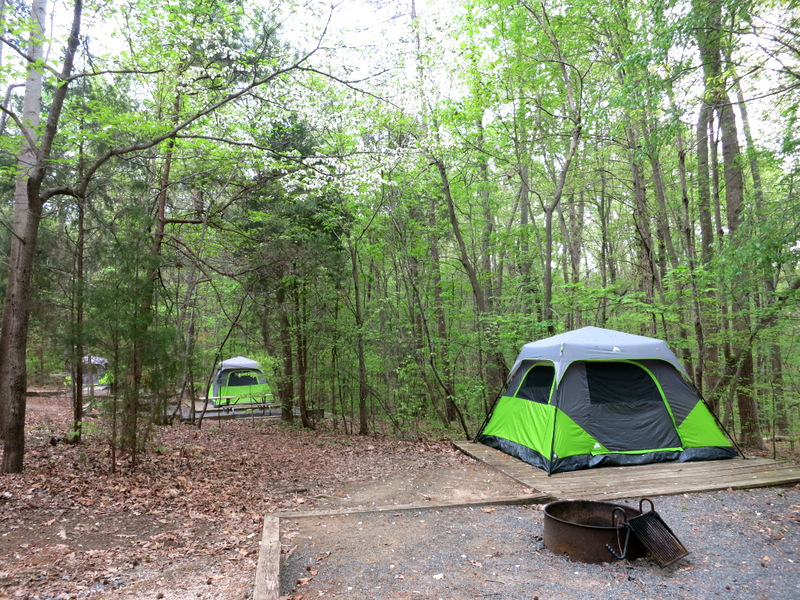 In general the campground is more suited to tents than RVs. There are only 12 RV sites, most of which are on some sort of hill. The sites are plenty long, but the hills combined with the tight corners makes this a campground better suited to smaller RVs. If you’re coming here with a larger RV definitely ask for a level site. Number 2 and number 5 are the largest level sites. The tent sites are really nice through, and they even have Rent-A-Tent sites with new looking tents set up on wooden platforms for rent. Cool idea! 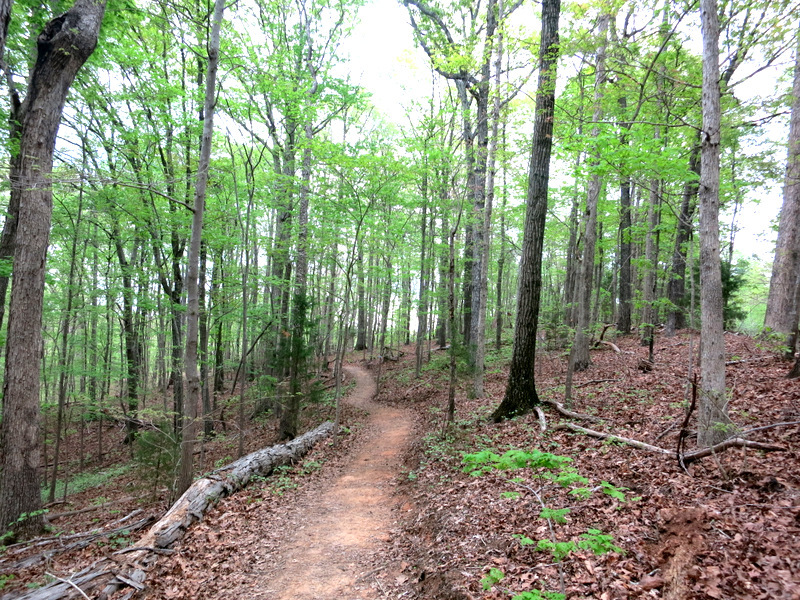 There is also an extensive network of trails that wind around the campground and along the edge of the lake. Each individual trail is short (and unfortunately no bikes allowed), but yesterday we were able to combine a bunch together for a nice 4-ish mile hike. This is the first time we’ve seen any sort of hill in months, and it felt good to hike up and down inclines again – even if those inclines were pretty mild. The truth is that we’ve both been feeling a bit unenthused about our east coast adventure lately. Remember about a month ago when I wrote that long post comparing RVing in west and east, and in the end declared it a tie? Well, if I was to write that again right now I have a feeling the west would win. I don’t know if it’s the near constant rain showers, those pesky bugs, or the fact that we’ve both been suffering from spring allergies. Or maybe it’s all the pictures of majestic mountains in the eastern sierras, red rock hiking adventures in Utah, and wide open New Mexico skies posted by our fellow RVers (you know who you are). Whatever the reason, we’ve really been missing the west lately and find ourselves dreaming about all the places we want to go when we return next winter. But that’s a long time from now. So yesterday on our hike we had the talk about trying to enjoy and appreciate where we are right now, instead of always looking forward to the future. For me, part of enjoying where I am right now is appreciating the glory of spring. 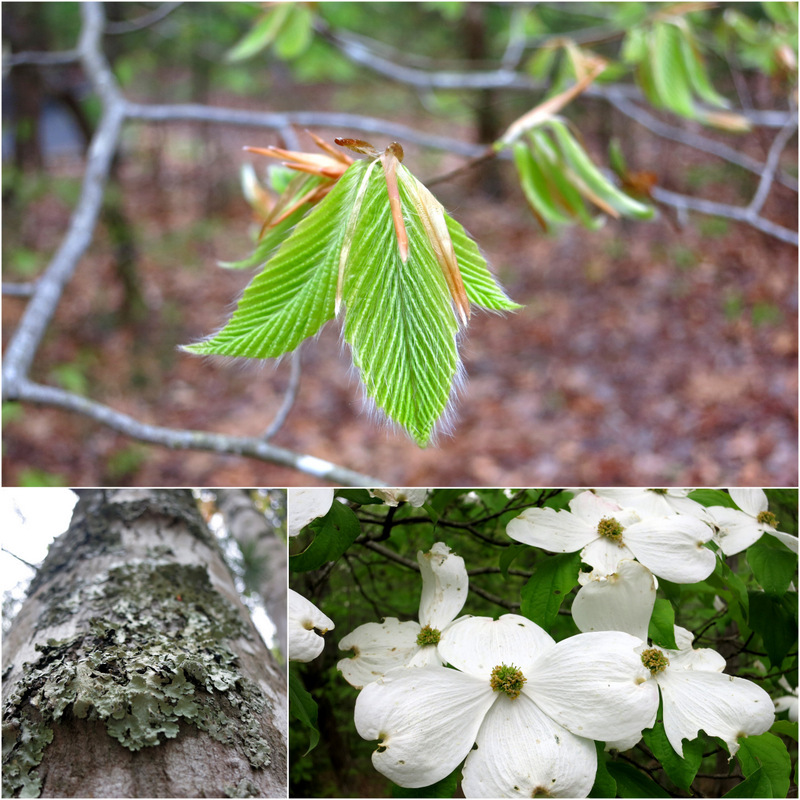 It’s always been my favorite time of year, and our spot in the forest this week is a great place to enjoy the bright green new leaves and profusion of sweetly scented Dogwood flowers. Hopefully the rain will stop and the sun will come out at least once this week so we can get out and see what Charlotte has to offer. Ha – I know exactly what you mean about the west coast bloggers right now – I can hardly stand to read some of their posts! I’m trying to stick close to the coast as much as we can, because at heart I really am a beach girl. 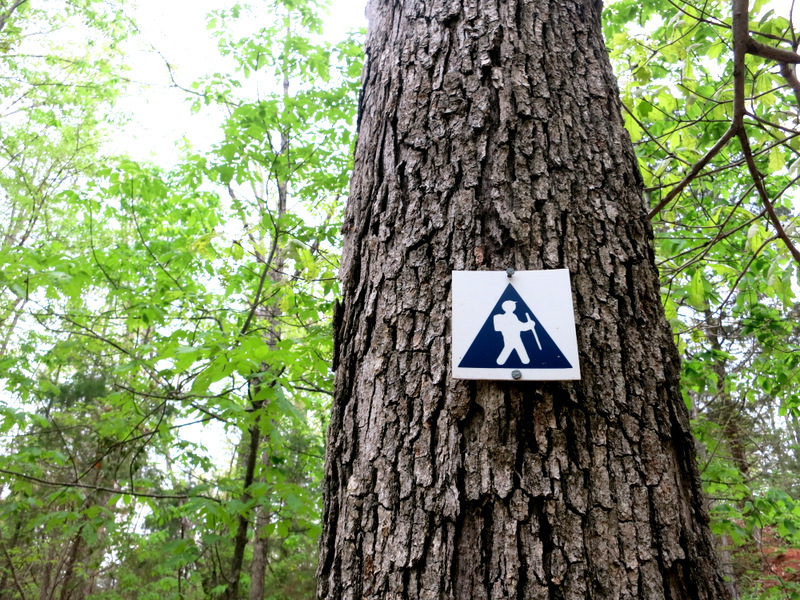 But I am almost embarrassed to classify some of my posts about one-mile flat trails as “hikes.” We’re definitely looking forward to getting to upstate NY and Maine for some “real” hiking! I know right? I wish they would stop posting such awesome pictures! It’s such a tease. You will find some real hikes for sure in NY and Maine, but it’s still not the same as Colorado and Montana! As you know we are east also. Going to the Outer Banks, Assateague in Md, Gettysburg, Pa then on to W Va. We enjoy the east and all the fresh seafood but we also miss the west. Just like you guys we will enjoy this year and move west next. Know you guys are having fun and many things to see in NC. It is a very beautiful state. The coastal part of the east is really nice, but it’s hard not to miss the desert and majestic mountains of the west. North Carolina is giving us a nice does of green right now though (along with soooo much rain). Amanda, this is just the thing I’ve been agonizing about! When we finally take off next year, I want to make a beeline for the West, having been stuck in Florida almost all my life. But it seems to make sense that we make the obligatory trip north first (Civil War battlefields, DC, and on up), spend winter in Florida (I’m really not excited about that), and then strike west in 2017. I’m also thinking it’s better to see the east first because the west will spoil us. But it kills me to put off for so long what I really want, so lately I’ve been thinking just go west first. One never knows what might happen and I don’t want any regrets. Thanks for your post! We had the same dilemma when we first took off from the northeast. It would have made sense to go straight south and see all the places you mentioned, then spend the winter in FL before heading west. We couldn’t do it though, and instead made a bee line for the west coast (and then stayed there for two years). I think you should do what makes you the most happy. The beauty of full-time RVign is that you can go anywhere! The bugs and humidity are two of the main reasons the West is best for us! We lived in Georgia. I have to admit though, the dogwood bloom was a sight for sore eyes! Georgia had more bugs than anywhere else! But it also had lots of blooming shrubs and trees which I really, really enjoy. Rent a Tent! Have not seen that yet, neat idea! Living without hills would be very strange. I know they make me happy! Here, in NM, we got a little rain and were so glad to have it. Good flowers in NM this year, much greener than when we were here in 2013. You have been in the green for so many months now! It’s very different, isn’t it? I’ve never seen rent-a-tent either. Seems like a great idea in an urban area such as this where people might not have camping supplies, but they still want to go camping. Glad that you’re seeing lots of flowers and green in NM. I’m doing my best to appreciate the lush green that surrounds us even if the downside is rain every other day. Now that we have been on both coasts, I have to say that the west suits us better. Hiking in the mountains and deserts can’t be beat, and often with little or no bugs. Yes, the hiking in the west is so amazing! Bugs and humidity most definitely put a big ding in the East coast experience. As you know, we’ve spent winters in Florida and love it, and we’re planning a big trip up the East coast to Nova Scotia next spring (unless your posts about traveling in the east change our minds, haha!). But we also love the West coast, the desert, and some parts of southern California. I guess we just enjoy a big variety of experiences. It seems no matter where we are, we sometimes need to have “the talk” about enjoying the present and not thinking ahead to the future. That rent-a-tent is a great idea and a nice way to lure people outdoors for a camping trip. I’m going against popular opinion by saying the desert is just not for us. We tried but just didn’t like being desert rats. Give us ocean water over cactus any day. Loved the mountains in Idaho, Montana, and Colorado but am so drawn to the scenic rocky coast of Maine. I like having a mix. I miss the desert now, but so missed green and trees after spending months there last year. Guess that’s why RVing fits us so well – we get to have the best of both worlds. 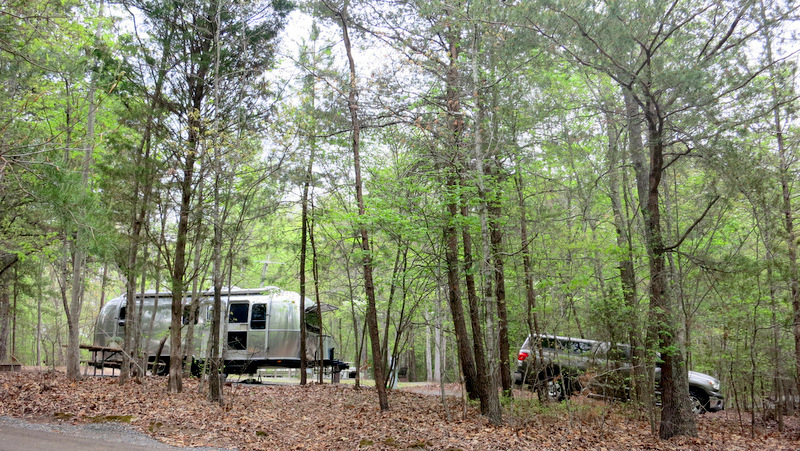 Have done lots of tent camping in Maine and looking forward to returning as RVers this year! I’ve been following your blog for a while and was looking forward to going to some of the places you have posted about in FL, GA and the Carolinas. Unfortunately we had to return to TN before we got to complete our trip. Now I’m looking forward to heading out west towards California in a few months. Since I’ve never been out west, what are the best months to be in that area? So sorry you were not able to make it to some of those places in the SE. On the flip side, you’re going to love CA! As far as the best time to go, I would say it depends on what part of the state. The southern desert of CA is best in the winter, while the northern part is best in the summer or fall. We really enjoyed December in San Diego, but I’ve heard that it’s nice pretty much year round. I would watch out for the rainy fall season if you visit the northern part of the coast (I think spring is better than fall). Also, one of favorite areas was the eastern side of the state along HWY 395, but it gets crazy hot there in the summer. I think early fall or spring is best for this area. The great thing about CA is that there are so many different climates that no matter when you visit you are sure to find a great part of the state. Have fun!! !